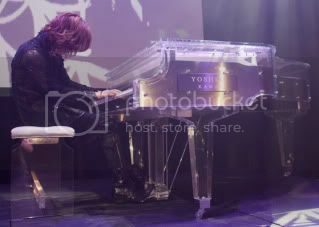 Yoshiki, drummer/leader of the Japanese rock band X JAPAN will put his favorite "crystal" piano on the auction block, donating all proceeds to help provide aid to the victims of Japan's earthquake and tsunami. The custom-made, plexi-glass Yoshiki Signature Piano, manufactured by Kawai with Yoshiki's name engraved on it, was used when the band played their legendary shows at the Tokyo Dome. The Japanese-born Yoshiki, who lives in Los Angeles, felt the earthquake tremors while in a Tokyo recording studio working on X Japan's first North American album, and was shocked by the large-scale damage across Japan. "It took awhile to locate my mother, but she is, thankfully, OK," says Yoshiki, "and I've spoken with (band members) Toshi, Pata, Sugizo and Heath, and they are all safe as well. I am praying for the people here who are still trying to locate their family and friends." X Japan has decided to postpone the release of their first U.S. single, 'Jade', that had been scheduled to be released on March 15th so that they may focus on their time and energies on helping with the recovery. In addition to raising money by auctioning his piano, Yoshiki will collect donations for the Japanese disaster relief through the Yoshiki Foundation America, his California non-profit, public benefit corporation with tax-exempt status as a section 501(c) (www.yoshikifoundation.com). The Yoshiki Foundation has already donated to American organizations such as the Make-A-Wish Foundation of America, the Grammy Foundation, and St. Vincent's Meals on Wheels.